You are here: Home / Enhanced Odds Bonuses / Soccer Betting Promotions / Sportsbook Bonuses / Sportsbook Promotions / Pick Your Own Boost with Today’s Enhanced Offer at Betway! 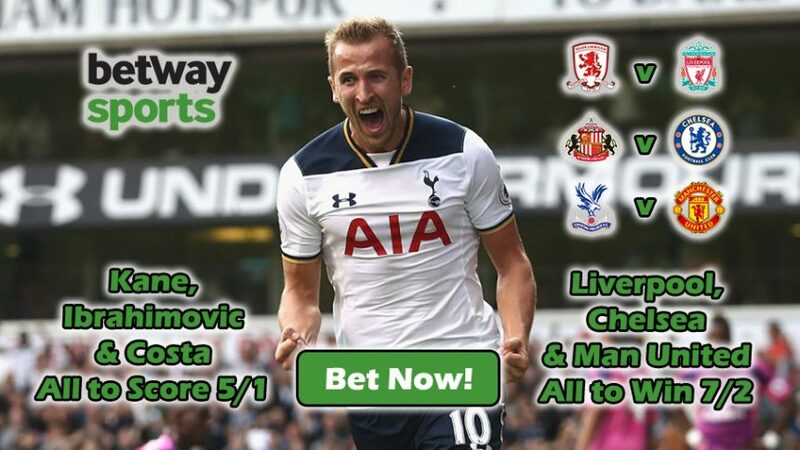 Not one, but two Boosts markets are being offered at Betway Sports. Today’s Enhanced Offer is a limited time deal, so hurry up! Midweek football has become a betting staple at Betway Sports that can see you capitalize on two special markets with Today’s Enhanced Offer. Just place your wagers on either the select Goalscorers for round 16 in the English top flight, or back the select clubs to win their games, or best yet is to bet on both offers to collect the greatest returns. BOOST 1: Place a wager on Liverpool, Chelsea and Man United all to win their respective games 7/2 (4.50) – odds were boosted from 11/4 (3.75). BOOST 2: Back three strikers all to find the back of the net in round 16 – Harry Kane, Zlatan Ibrahimovic and Diego Costa all to score tonight 5/1 (6.00) – previous odds were 3/1 (4.00). Note: to make sure you qualify for Today’s Enhanced Offer, place your wagers on these two markets before 19:45 GMT tonight (December 14). Liverpool stand in third position (31 pts) behind the likes of Arsenal (34 pts) and leaders Chelsea (37 pts), while Man United are in sixth spot (24 pts) and are slowly starting to break into the top positions. We have no doubts the Reds and the Blues will pull off an easy win against their opponents; all you have to do is take a look at their records so far this campaign and you’ll immediately be convinced. Jose Mourinho’s men are gradually shaping up to be a fearsome side – despite going through an acclimatization process earlier – so we’d still back them to win their game tonight against the Eagles. Allow yourself to have a little fun by also placing a bet on the select three strikers to bag a few goals with Today’s Enhanced Offer. Kane has found the back of the net seven times in 10 appearances, while the imposing Ibrahimovic is currently on eight in 14 outings – already in his first season in England. Costa is leading the goalscoring charts with 12 goals in 15 appearances for the Blues. With all their attacking prowess in front of goal, you’d have to be crazy not to back them to score for their sides in tonight’s encounters. Make your betting investment count with Today’s Enhanced Offer; place wagers on two Boosted markets and win even more for tonight’s Premier League encounters. Make a killing with Today’s Enhanced Offer!